What Are the Search Interface Page Types? The Search Interfaces tab of the Coveo .NET Front-End Interface Editor contains several horizontal and vertical menus illustrated and briefly described in the following figure and table. 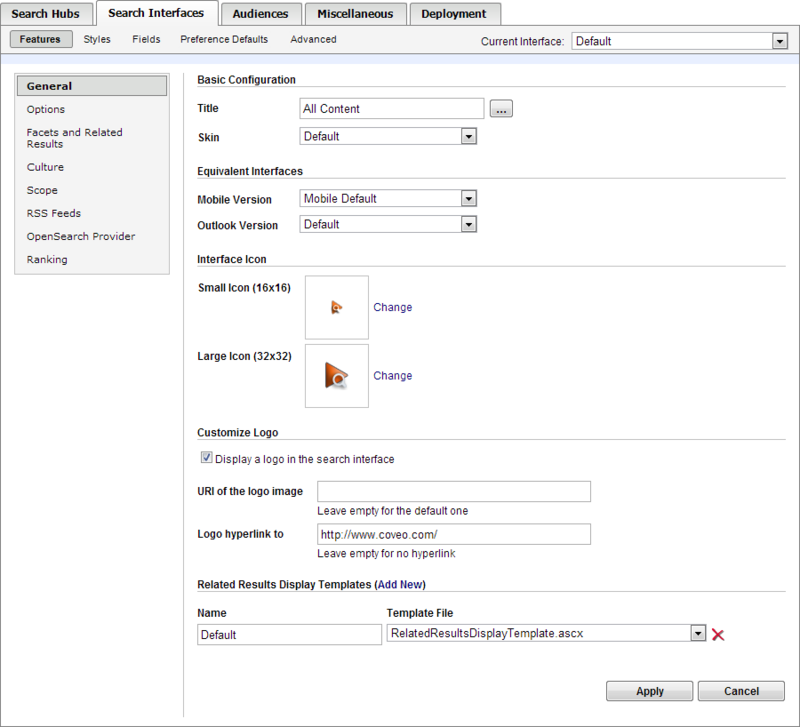 Features General Used to select the title, equivalent interfaces for other hub versions (standard, mobile, Outlook), and the logos for the search interface (see Changing the Logo Appearing in a Search Interface With the .NET Interface Editor). Options Used to activate which features pertaining to the search box, result list, displayed result elements, and result highlighting are available in the search interface (see Activating Search Interface Options With the .NET Interface Editor). Facets and Related Results Used to configure and set the position of facets and Related Results panels available in a search interface. Culture Used to configure the language in which the search interface appears and other cultural aspects (see Configuring the Culture of a .NET Search Interface). Scope Used to define the scope of the interface and define a filter that applies to the queries performed (see Configuring the Scope of a .NET Search Interface). RSS Feeds Used to configure the RSS options (see Specifying the RSS Feed Parameters With the .NET Interface Editor). OpenSearch Provider Used to publish a search provider that end-users can then define in their browser as a search engine (see Publishing an OpenSearch Provider for a Coveo .NET Search Interface). Styles N/A Used to customize the Cascading Style Sheets (CSS) used to format elements of the search interface (see Modifying .NET Search Interface CSS Styles). Fields Display Fields Used to add information to each result entry (see What Are Display Fields?). Search Fields Used to add fields to the Advanced Search page of the search interface (see What Are Search Fields?). Sort Fields Used to configure the search results sorting choices available to end-users in a search interface (see What Is a Sort Field?). Export to Excel Fields Used to select fields to include in the file created with the Export to Excel function (see Selecting Fields to Export to Excel With the .NET Interface Editor). Preference Defaults Used to modify the default values of user preferences (see Modifying Default .NET Search Interface Preferences). End-users can modify the default values (see Modifying .NET Search Interface Preferences). Used to open results using a different URI than the one indexed (see Creating Alternate URI Rules for a .NET Search Interface). Example: You can create an alternate URI to open Microsoft Exchange emails in a Web interface instead of the native mail client. Security Provider Used to add security providers used by the search interface to retrieve documents whose security permissions are different from the Windows ones (see Adding Security Providers to a .NET Search Interface). Custom Scopes Legacy menu used to add a new custom search scope and to specify a filter expression for the entire scope, as well as a filter expression for every remote index in the scope (see Configuring a Custom Scope With the .NET Interface Editor).